A few days ago – April 3 – I wrote here about the history of energy prices. 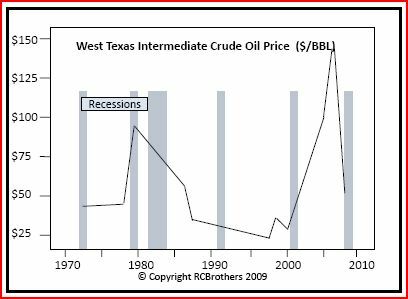 In that post, I mentioned that many of the alternative energy plans we hear about today actually have their roots in our previous experience with escalating oil prices (ca 1975-1980). Solar, in particular, had made a great commercial start before plummeting oil prices in the early 1980s pulled the economic rug from beneath the blossoming alternative energy marketplace. If you look closely, for example, it’s still possible to see 1979 vintage solar panels on rooftops in sunnier parts of the country. On a larger scale, solar-to-steam-to-electricity plans were on drawing boards around the world – utilizing acres of mirrors focusing sunlight on a central receiver / generator tower – and a demonstration unit was actually built in California. – Upper temperatures are limited (without substantial additional investment in complex and expensive concentrator and control apparatus). Space heating is OK, along with some modest industrial processes, but more ambitious energy processes require higher temperatures than conventional (flat plate) solar collectors can achieve. Regardless of the approach – solar thermal or photovoltaic – I have this nagging worry that solar energy history may be about to repeat itself, with plunging oil prices removing all the economic incentive for alternative energy development. I’ve been thinking a lot about alternative energy lately. Partly it comes from riding the rollercoaster of $1.50-to-$4-to-$1.50 gasoline and $20-to-$140-to-$40 crude oil prices, partly from the on-going greenhouse gas – climate change discussions, and partly because of our entanglements with OPEC and Middle East politics. But mostly it comes from a long-held interest in the interaction of fossil-based energy and feedstocks, alternative energy sources, and geopolitics. Taking a semi-long, say a 30-40 year, view, this isn’t the first time we’ve felt an oil price spike. Crude was nearly $100 a barrel (in today’s dollar equivalent) three decades ago. At that level, energy prices drove great efficiencies – from better insulation in our homes and factories, to more fuel efficient cars, machinery and home appliances, to better building products and construction techniques. That earlier energy price excursion spawned thriving businesses in most of the alternative energy technologies we hear about today. Active and passive solar heating and hot water popped up on rooftops around the country, huge solar-to-steam-to-electricty schemes came off drawing boards around the world, photovoltaics were promising but tantalizingly just a bit too expensive. Plans to derive energy from ocean waves and tides, geothermal, even electricty microwaved down from huge solar panel satellites were seriously advanced. Brazil perfected a hugely successsful experiment in waste-to-ethanol energy economy. So, why are we still so dependent on coal, natural gas, and imported petroleum? The precipitous drop of energy prices in the 1980s, followed by two decades of near historically low prices killed all but the most hardy of the alternative energy enthusiasts and their ventures. Sounds awfully similar to what we’re seeing today, doesn’t it? The question is – “What should we do about it this time?” The answer isn’t really technology – the fundamental science for many energy solutions is already well known. The real questions revolve around our willingness as a society and a government to invest the long range resources, vision and commitment to nurture these alternative energies through their infancy to a degree of commercial viability. I expect there’s a lot more to say around these topics. I’d like to hear what you think.